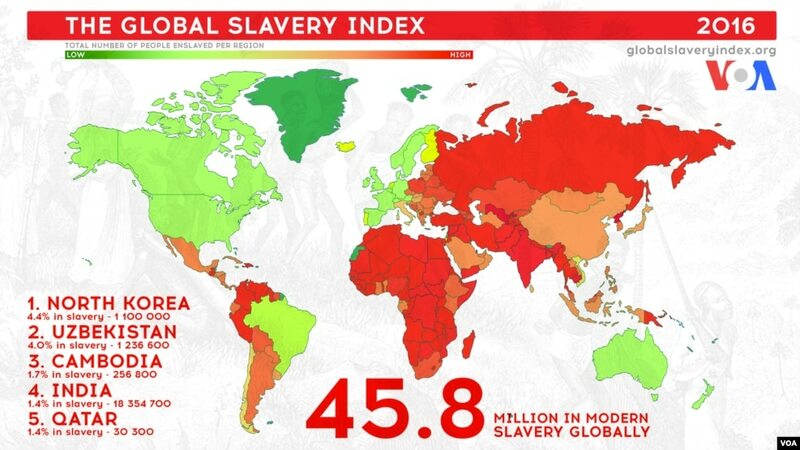 Almost 46 million people are living as slaves globally with the greatest number in India but the highest prevalence in North Korea, according to the third Global Slavery Index launched with Australian actor Russell Crowe. A major new report from the World Health Organization has revealed that global diabetes cases have almost quadrupled to 422 million in 2014 from 108 million in 1980. Diabetes now affects nearly one in 11 adults with high blood sugar levels linked to 3.8 million deaths every year. The American middle class is losing ground in metropolitan areas across the country, affecting communities from Boston to Seattle and from Dallas to Milwaukee. From 2000 to 2014 the share of adults living in middle-income households fell in 203 of the 229 U.S. metropolitan areas examined in a new Pew Research Center analysis of government data. In the last two years, 160 countries publicly announced clean energy plans to be achieved between 2020 and 2030. These commitments represent the largest move to clean energy to date, with both major developed nations and emerging economies making pledges, including Small Island States and Least Developed Countries. There's now an interactive graphic that shows your country's emissions as well as the fossil fuels it uses, such as coal and petroleum, to see how it is contributing to clean energy. It lets you click on countries to reveal those with the largest carbon footprints, with China leading the way spewing out 10540.8 million metric tonnes of the gas every year. The NACDEP and CDS boards will coordinate their fall Board of Directors meetings in Big Sky, MT on Sept. 9. The MACDEP Executive Committee is now discussing if/how we could coordinate our MSU CD Update to take advantage of their presence in Montana. Please let me know if you have any comments regarding meeting on this date.